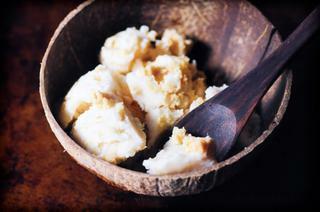 An easy, creamy and delicious Double Coconut Caramel Cookie Dough Ice Cream. A delightful vegan coconut ice cream base made with sweetened condensed coconut milk is studded with tasty and chewy gluten-free coconut caramel cookie dough bites in this frozen treat perfect for summer or any time of the year! Now, who doesn't love a good ice cream . . . This creation came about when I was excited to try out Sweetened Condensed Coconut Milk (by Nature's Charm) for the first time . This delicious ice cream requires no other sweeteners than the condensed coconut milk which lends the sweetness and the creaminess to this ice cream base. Throw in some chunks of gluten-free coconut caramel (by Nature's Charm, too!) cookie dough bites and you're in vegan ice cream heaven! We truly enjoyed our little experimentation with sweetened condensed coconut milk and found this ice cream to be ridiculously tasty and easy to throw together! We hope you do, too! A super creamy and delicious Double Coconut Caramel Cookie Dough Ice Cream. Gluten-free, vegan, and easy to make, too! In a large bowl whisk together condensed coconut milk, almond (or coconut) milk, and shredded coconut until well combined.Place bowl into the fridge to chill for at least 2 hours.In another large bowl combine coconut flour, caramel sauce, maple syrup, and salt.Using your fingers or a fork, mix until all is completely combined and you have a ball of cookie dough.Break cookie dough up into large or small (your preference) pieces/chunks. Set aside.Pour your chilled ice cream base into your ice cream maker and churn according to manufacturer's instructions.A few minutes before your ice cream if finished gently and slowly throw a few pieces of cookie dough at a time into your churning ice cream until your cookie dough is dispersed throughout.Enjoy a softer yogurt-y version of this ice cream right away; or scoop ice cream into a loaf pan; smooth the top; and then freeze for 4-6 hours before serving.Let the ice cream sit for at least 10 minutes before scooping and serving when pulled out of the freezer.Enjoy!